It's a story about a decision to eliminate apostrophes from street signs. The logic is amusingly twisted. "We keep debating apostrophes in meetings and we have other things to do," said one of the politicians. 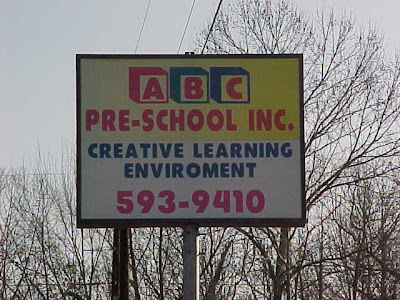 Removing apostrophes seems a silly way to end a debate; now, the signs are all wrong. Grammarians will never let this one go. Still, what SPOGG really objects to is the sub-headline in the MSNBC story that says "grammarians revolt." While we aren't proud that it's nearly 3 p.m. and we still haven't taken our daily shower, we generally prefer the term "rebel" in cases like this. "Revolt" can mean to rebel or defy authority, of course. But it's one of those words that can be easily confused, so we avoid it, much as we avoided the body-odorrific British journalist we met last week on an assignment in Los Angeles. SPOGG is not revolting! Just a little unclean! We promise! Police using Google maps struck gold--green gold, that is. The satellite photos revealed a marijuana plantation. A cameraman films packages containing drugs during a news conference by police in Zurich, Switzerland. Swiss police stumbled across a large marijuana plantation while using Google Earth, the search engine company's satellite mapping software. Police said they arrested 16 people and 1.2 U.S. tons of marijuana as well as cash and valuables worth $780,000. We get how they arrested people. But arresting the pot? And the cash and valuables? That seems excessive. Free the weed! Thanks to Woody E. for the link. Lickerish: We Have a Winner! And our runner-up: The Other Side: What Women Want. 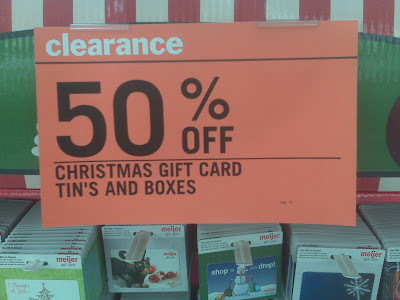 It's such a small thing, the unnecessary apostrophe in "tin's." And yet it's so annoying, especially next to the correct "boxes." We loved these words from Garner's Usage Tip of the Day. libido. Although dictionaries once recorded /li-BIY-doh/ as the preferred pronunciation, /li-BEE-doh/ is now the established preference in American English. licorice (/LiK-uh-rish/) is the standard spelling. "Liquorice" is a variant form. This word shouldn't be confused with its uncommon homophones, "lickerish" (= lascivious, lecherous) and "liquorish" (= tasting like liquor). If you keep a blog, please use "lickerish" in context. First person to alert us wins a copy of Not Rocket Science by the great Craig Conley. 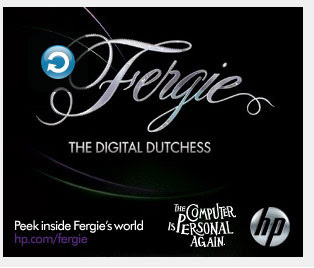 The word is "duchess." Seriously. Can you please just hire someone to edit your copy? We admit we rolled our eyes mightily yesterday when CNN breathlessly reported Obama was having a do-over on his swearing-in. No doubt the same people who insisted he was ineligible to be president were eagely preparing lawsuits insisting this, too, meant he was illegitimately in office. Gah! Please get over it. In any case, we thoroughly enjoyed this New York Times bit by the brilliant Steven Pinker, which not only blames the goof on the Chief Justice--but also speculates what really was behind it: a tendency toward hypercorrect grammar. In the Houston Chronicle last week, we noticed an ad for the local 99¢ Only Stores. It said "Now open 8AM to 9PM 9 days a week!!" We thought maybe it was a one-time typo, but noooooo--today's paper has an ad from the same store, with the same information. We think the extra two days may be located in the DiscWorld, probably in Ankh-Morpork. I bought a package of "eclipse" gum one day last week, and it says on the front, "Natural Germ Killing Incredibly Fresh Breath!" But what does one do if one has to kill unnatural germs with one's incredibly fresh breath?! SPOGG reads this label differently. We believe it's a natural germ--as opposed to a lab-created one--on the rampage against minty breath. This germ must be found and stopped ... before it multiplies. "I wanna make popular music, but I want less fans," West tells Vibe magazine in its February issue. "I want the freedom of having less fans. It's like the freedom of having less money. If you have less money, you have less responsibility." For a mere $1 million, we would be happy to teach him the difference between less and fewer. We are happy to take on the responsibility of such a payday, just as we're sure he'd appreciate all the freedom that relative poverty brings. Oh, how we wish we'd thought of this ourselves. Why, why, why do sportswriters insist on using the word "winningest"? We have hated this word since we first encountered it the newsroom of our college newspaper. The years may have softened many things about us, but not our antipathy toward this unfortunate superlative, which Merriam-Webster traces to 1972. We know what it's supposed to mean--the coach or team with the most wins. Whatever happened to "best" being the go-to word here? Last time we checked, the team with the most wins is the best one. Is there some other criteria we've forgotten when it comes to sports? Some mix of best uniforms + most bitchin' stadium + face-paintingest [sic] fans that goes to "winningest"? Or are sportswriters reaching into their sweaty word bags for a fancier alternative to a short, effective word? What's funny is that "losingest" isn't used with anywhere near the frequency. When it comes to "worst," sportswriters at least don't mince (or make mincemeat of) words. The picture above depicts "mantyhose." In other words (we just typed "worse"--paging Dr. Freud! ), they are pantyhose for men. As MSNBC put it, "This is the flagship men's pantyhose style by Ohio-based Comfilon's Activeskin Legwear for Men. The company, which has seen a steady increase in sales, uses the tagline, 'This is NOT your mother's pantyhose.'" Shouldn't it be "These are NOT your mother's pantyhose?" We do not wear pantyhose, but if we wanted to, we would say, "Where are our pantyhose?" We would not say, "Where is our pantyhose?" Perhaps our lack of familiarity with pantyhose has us confused on the matter. Is it singular? Plural? We're going to go with the plural, on the basis of their kinship with pants. Pants are plural. Pantyhose, mantyhose...plural. Thoughts? Send them to info AT spogg.org. Grammar Girl features us today on her site. Karen S. sent this photo to us. It demonstrates just how sophisticated today's cars really are. 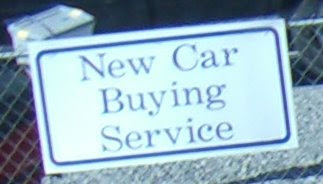 The new ones can buy service for themselves! Anyone who's ever wasted an afternoon in the service shop knows how life-changing this really is. Of course, it's also possible that there should have been a hyphen between "car" and "buying" (or even between "new" and "car"). This would have made it clear that there is a service available for people buying new cars, or a new service available for people buying cars--whichever is the case. Sometimes, grammar is just a pain. Especially when it means we still have to take our cars to the service station ourselves. It has come to our attention that the green vegetable we accused of illiteracy recently is most likely a jalapeno, not a pickle. SPOGG regrets the error. In our defense, we were not able to look under his hat, and the content of his pants is ambiguous. He still spelled "spicy" incorrectly. 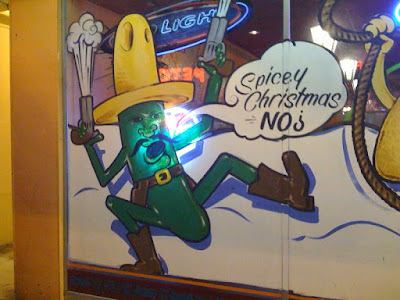 For a jalapeno--if he is indeed that--this is inexcusable. A belated thanks to John at The Writing Workshop for removing the scales from our eyes. While we are pleased that they made the correct plural possessive of "girl," and while we admire the creative expression that is "zipper protuberance," we think the image that comes to mind--of someone's eyeballs/beauty caught in a zipper--ultimately ruins the effect. Hurl. We just noticed something unusual on our Caller ID. A number we didn't recognize popped up, along with the name INAVALIABLE. We believe some nearly clever minx has obscured the name of her telemarketing business. Unfortunately, she should have said her name was UNAVAILABLE, as that is an actual word. And while we are certain she was calling to sell us something invaluable, we did not pick up the phone. We don't mean to be sour, but this pickle can't spell--and if he's trying to hit the adjacent taco with the lasso, he also can't aim worth beans. Ay caramba! What a spicy mess!